He talks about how quickly the 2011 Arab Spring revolutions had erupted, about Libya becoming a pathway for jihadis to Europe, and about visiting William Shakespeare's home in Britain as a teen. DUBAI, United Arab Emirates — A journal made public by the CIA and apparently handwritten by one of Osama bin Laden’s daughters offers a glimpse into how the late al-Qaida leader viewed the world around him. It also reveals his deep interest in the 2011 Arab Spring revolutions that were unfolding in the months before a U.S. raid killed him. He talks about Libya becoming a pathway for jihadis to Europe, of his time as a young teen visiting William Shakespeare’s home in Britain, and of how quickly turmoil had gripped the Middle East. 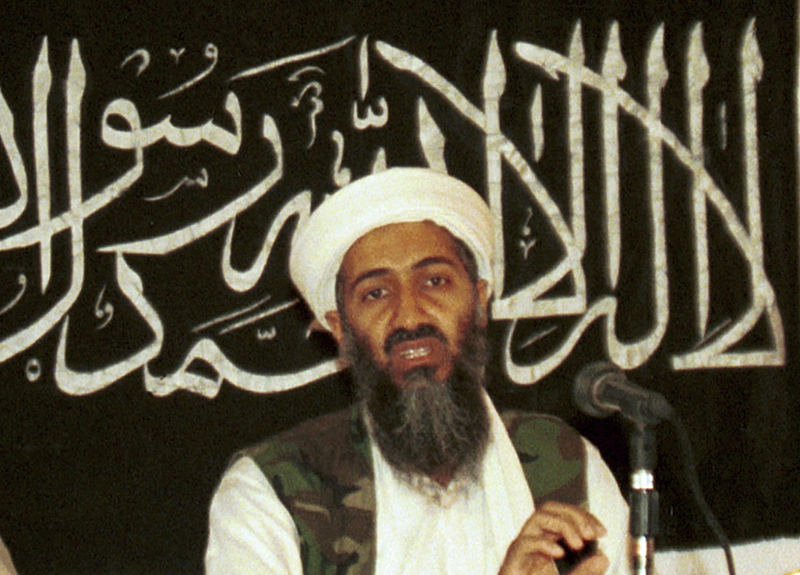 In this 1998 file photo made available on March 19, 2004, Osama bin Laden appears at a news conference in Khost, Afghanistan. The 228-page journal meanders between discussions, thoughts and reflections that bin Laden shared with his family about how to exploit the uprisings, what to make of the rapid changes unfolding in the Arab world and when al-Qaida should speak out. “This chaos and the absence of leadership in the revolutions is the best environment to spread al-Qaida’s thoughts and ideas,” bin Laden is quoted as telling his family in the document. Bin Laden’s wife, referred to as Um Hamza, assures him that a tape he released seven years earlier calling out the rulers of the region as unfit could be one of the major forces behind the Arab Spring protests roiling the region. The journal appears to cover conversations between bin Laden and his daughters, Miriam and Somiya, his wife and his sons, Khaled and Hamza – the latter of whom would go on to become a potential successor to lead the group his father founded. The journal is titled “Special diaries for Abu Abdullah: Sheikh Abdullah’s points of view – A session with the family,” which refers to bin Laden by his traditional Arabic name. The conversations took place between February and April 2011, with the journal entries dated according to the Islamic calendar. During that time, uprisings in Tunisia and Egypt had ousted longtime autocratic rulers, touching off protests in Libya, Yemen, Bahrain and Syria. The Middle East was on the cusp of unstoppable change, chaos and turmoil. In Libya, the uprising there would end with Moammar Gadhafi’s death months after bin Laden was killed. In Yemen, al-Qaida would gain a greater foothold and remain active amid the chaos of war and famine. In Bahrain, the Sunni-led monarchy would launch a crackdown on the country’s Shiite majority. In Syria, the government’s lethal response to a protest by schoolchildren in early 2011 would spark mass protests across the country and ignite a war and massive refugee crisis that continues today. The reflections, jotted down in blue ink at times and at others in red, refer repeatedly to media reports of what was happening across the region. Bin Laden appears concerned by the speed of some of the region’s revolts, believing that a gradual approach would help avoid the backlash of a counter-revolution as regime figures sought to hold onto power at all cost. “I am upset by the timing of the revolutions. We told them to slow down,” bin Laden is quoted as saying, though it’s not entirely clear which countries he is referring to. “This is why Gadhafi and his son say that the extremists will come from the sea, which will be an area of operation for al-Qaida. This will be the Somalia of the Mediterranean,” he is quoted as saying. Still, bin Laden appears reluctant to issue a statement in support of Islamists in Libya for fear that if Gadhafi is ousted, the U.S. will try to expand its footprint there. Yemen is a primary focus of the journal entries. Al-Qaida’s branch there is among its most active in the world and the journal suggests al-Qaida was plotting an assassination attempt against Yemen’s embattled ruler at the time, Ali Abdullah Saleh. There is little indication that the writer had much information about what was happening in the region beyond what was reported in the media. This could indicate that bin Laden had become isolated in his final months hiding out in Abbottabad, Pakistan, where U.S. forces would find and kill him a little over a month later. Or it could also be that bin Laden was shielding his relatives from al-Qaida intelligence. He says this was a result of his home and school environment. Separately, he describes his father as a pious man. “There wasn’t a particular group that was guiding me, like the Muslim Brotherhood,” he is quoted as saying. From a young age, he appeared to be unfazed by worldly spoils, recounting a story about declining a new watch from his wealthy father. He recalls a summer spent studying in the U.K. when he was 14, including a visit to the home of William Shakespeare. His time in Britain left him feeling uneasy and he decided not to return the following summer. “I saw that they were a society different from ours and that they were morally corrupt,” he says. Bin Laden imagines that Saudi Arabia would soon feel the “tsunami” of change sweeping the region. The late al-Qaida chief held Saudi citizenship until the early 1990s, before he was stripped of his nationality by the government.